Like most people I am rather averse to seeing litter all around the place. 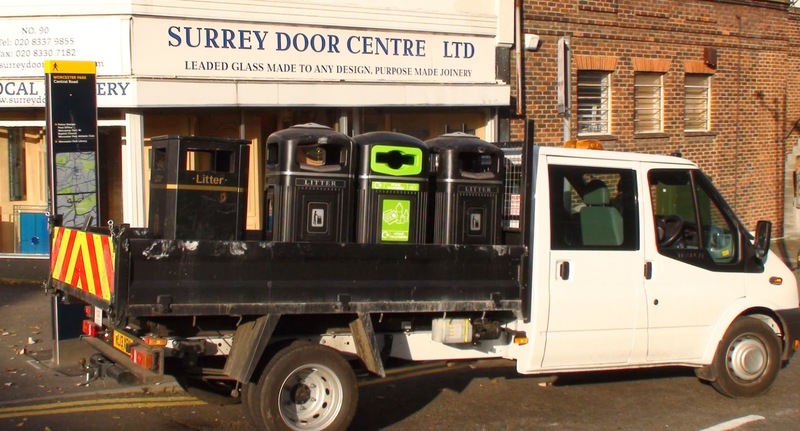 So when on Tuesday I saw this truck delivering some more litter bins to Central Road I was reasonably pleased. 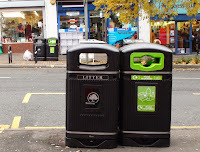 I guess I still am 'reasonably pleased' with the additional bins around the place. 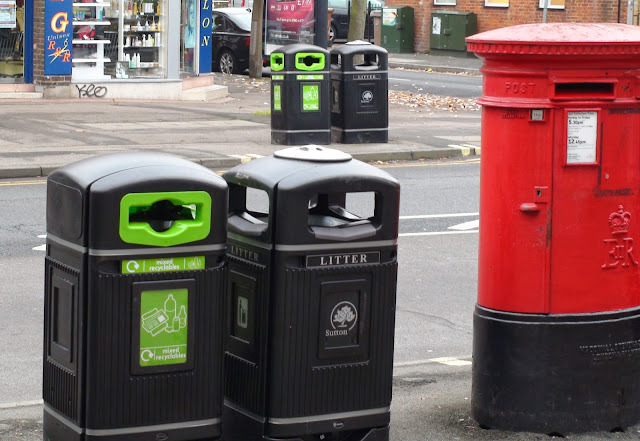 These include recycling bins which I am also pleased about although I do wonder if they will make much difference if all Sutton's rubbish is destined to be burned in the Beddington Incinerator. I just find myself wondering if we've perhaps swung a bit too far the other way in regard to the availability of rubbish bins. Maybe it's just me noticing them all but there do seem rather a lot in Central Road now. Then again perhaps that's what we need to keep the street clean. What do you think dear readers, of all our shiny new bins? "I know I'm a tad sad but as I drive through WP every day and to be honest get bored silly doing it, I have to say my number is 44. Why do you ask 44? Hard to imagine that 44 is that interesting..., until you count the number of rubbish bins From Sainsbury's to the Station. Some of these bins are a matter of 20 feet apart, Do you think the council have better things to spend some money on? Imagine the manpower alone to vist and empty all 44! Don’t get me on those stupid brick ‘crossings’ that are sinking again, and we pay the wages of these people who come up with these wonder schemes, imagine if it was their own money im sure they would be more careful how they spent it!" 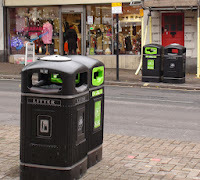 "This morning’s count is 53 assorted bins in the high st. They must be breeding..."